predators that were killing our poultry and other farm animals, yet Sadie's pushed them back deeper in the forest farther away from the house. 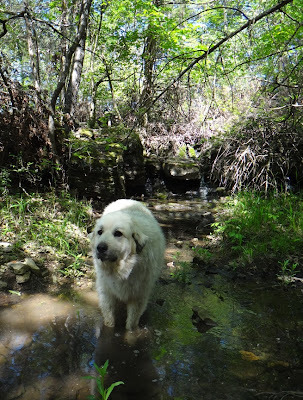 There's plenty of room for all, plus plenty of water for all to boot, yet it sure helps to have Sadie defining boundary lines immediately surrounding the house and farm animal facilities in a language that wild predators truly understand. Good dog, Sadie! Good dog!